Products & Services-> Wellness PackTriple starter pack,Pefectaire microbe solution drops. 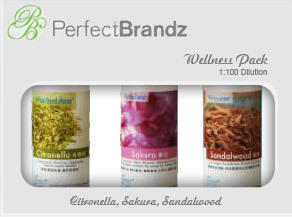 The Wellness Pack is a blend of Citronella, Sakura, Sandalwood, Each a 40ml bottle! Sleep better, feel healthier, be more alert. Tired, aching and feeling down? Then the Wellness Pack is just for you. Rejuvenate and reenergize yourself!